"...It’s frustrating, then, that so many of the performances in Cheryl Lynn Bruce’s production feel underdeveloped. Andrew Boyce’s brutalist schoolhouse set should double as a kind of gladiatorial arena where cast members can go toe to toe, but very rarely does anyone draw blood. Abercrumbie does great work capturing Nya’s slow nervous breakdown, and Brooks delivers a pair of pitch-perfect rants, but the rest of the cast falls short. Pipeline keeps returning to the notion of rage as a young black man’s inheritance, but the fury doesn’t come through in the performances. Given Chicago actors’ knack for high emotion, you’d think this production would at least have that part down." "...Omari is 16, maybe 17 years old and he’s in serious trouble. He’s black, a bright kid, from a decent family. True, it’s a broken family. Omari’s mother, a high school teacher, and his father, a lawyer, are divorced. They’re good people. They send O – everybody calls him O – to a private school. The boy is deeply angry, and now he’s facing expulsion from school, and maybe much worse, for assaulting a teacher. 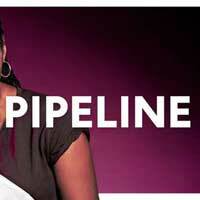 This the perilous crux of Dominique Morisseau’s play “Pipeline,” on gripping display at Victory Gardens Theater." "...Let's Play recommend that you see ‘Pipeline' at Victory Gardens to enhance your experience and dialogue about a real problem that is plaguing our school system and the children of color within our society." "...There is no doubt that America’s educational system has a race problem. There is also no doubt that it will continue to have a race problem until the country at large takes a long, hard look at itself. We can hope that through the arts that the country can shift and find equity. Evermore will we be grateful for Morisseau and companies like Victory Gardens that dare to speak truth to power."